Coffee, school, lab, repeat. This is just a glimpse of the day in the life of a doctoral student at FIU. Each day, doctoral students dedicate long hours to becoming experts and contributing to their field of study. For many, grad school is perceived as survival of the fittest and can be a lonely experience, especially for students of color. As literature on graduate student success suggests, a sense of community plays an important role in fostering a greater student success and satisfaction. The graduate fellowship programs within Student Access & Success (SAS) cater to minority students and are designed to bring about such a community. These fellowships include the FEF McKnight Doctoral Fellowship; Graduate McNair Fellowship; NSF Bridge to the Doctorate Fellowship and the Graduate Minority Opportunities Program. Through SAS graduate fellowship programs, students have actively created support networks and have fostered relationships that extend beyond the classroom and into their daily lives. Originally from Louisiana, Lamar Burton, a Ph.D. student majoring in electrical engineering, left his home to pursue his doctorate at FIU. Growing up in a place where minority youth are not typically exposed to STEM programs, Burton saw FIU as a place to further his education. What he found was not only a place to grow in his field, but a home. Through these fellowship programs, SAS has aligned services that create a sense of community and enhance networking and outreach opportunities throughout Miami-Dade County. Two recent events hosted by SAS were the MLK Evening with SAS Graduate Fellows and the SAS Family STEM Day in partnership with the City of Miami Gardens. One event focused on celebrating community and successes and the other provided the graduate fellows an opportunity to share their research with elementary and middle school students and their parents. Serving as SAS’ signature graduate fellow event, the MLK Evening with Graduate Fellows is a chance for graduate students to shine. Held every January in honor of Dr. Martin Luther King Jr., the event is an opportunity for graduate fellows to share their knowledge and experience on being a minority student pursuing a STEM degree. Through an interactive panel discussion, graduate fellows describe the benefits of pursuing a graduate education as well as the close-knit bond they have formed with one another throughout their studies. In addition to undergraduate students asking questions, they are challenged and inspired by the graduate students to take their education seriously and to consider pursing graduate school. “Given the opportunity to interact with these students and seeing their enthusiasm took me to a realization that we absolutely have a great future ahead,” said Sana Nasim, a 3rd year Ph.D. student majoring in biomedical engineering. SAS Family STEM Day, in partnership with the City of Miami Gardens, gives local elementary and middle school students a front row seat to the action and wonder of science. The day kicks off with a brief question and answer session where the topics of research and minorities in STEM are discussed. Afterward, guests are invited to interact with the graduate fellows and are encouraged to ask questions, participate in the graduate fellows’ research demonstrations, and share ideas on science projects. “I didn’t fall in love with science until fifth grade,” says Rosa Cromartie, a 2nd year FIU Ph.D. student in chemistry. Another collaboration that involves FIU graduate fellows is the Miami Gardens Engineering and Science Fair. This initiative exposes more than 200 elementary and middle school students to STEM. 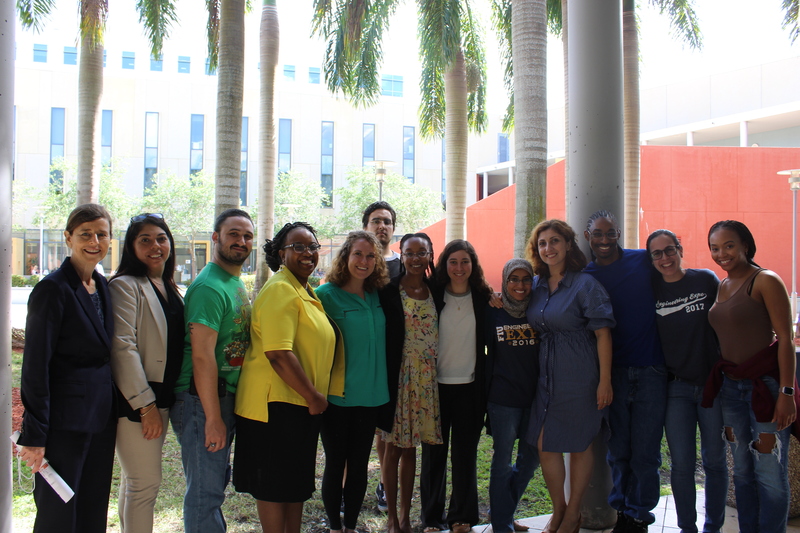 FIU graduate fellows serve as judges and mentors to students as they present their science projects. The culminating event is the awards ceremony that engages the parents and where the science fair winners are recognized. These initiatives helped the parents and children engage, ask questions, and expose them to many more career opportunities that some may not have thought possible. The interactions have led to positive influences as parents have contacted some of the graduate fellows for ideas on their children’s future science projects. Through the SAS fellowship programs, SAS has made it a priority for the graduate fellows they serve to not only excel in their academics, but foster a space of camaraderie, inspire their younger peers and encourage giving back to the community. McKnight Fellow David Riera believes that the mentorship and support system provided by SAS has helped him and his peers realize that they are not alone in this education process, and can lean on each other for support. To Burton, the fellowship programs that SAS offers represent growth, friendship and a bond that goes beyond education and completing a degree. For more information on the SAS Graduate Fellowships, contact Student Access & Success at sas@fiu.edu.